On October 7th, 2053 a large comet collided with Jupiter’s moon, Europa. It caused the release of large amounts of Nitrogen and water vapor creating a new atmosphere. This event quickly elevates the moon into a suitable target for human colonization. The drive for setting up a permanent presence on Europa is further driven by the asteroid mining that is taking place in the solar system. A presence on Europa, with its vast resources and ample supply of water, would provide an ideal interplanetary ‘gas station’ for getting raw materials back to the growing population of Earth. With the possibilities of vast sums of money to be made, and the allure of controlling the new resource, a new ‘Gold Rush’ mentality developed among the nations on Earth. Many nations quickly set up programs to make the journey to the new world, but required willing volunteers to do the actual mining. To recruit these volunteers, they presented this as a great opportunity to be a part of history and gain valuable riches for their families. The standard offer to a volunteer was to offer a deal in which the nation would pay for your journey and equipment (basic mining vehicle, small house, and rations) and you would work for the nation to pay the debt off at 3 times the initial cost. This was told so the nation could continue to send new volunteers and to cover the cost of returning the mined goods to Earth. After the debt was paid off, you would be offered a very comfortable salary to continue mining for the nation. With the reported amount of riches, most miners would be able to pay their debt off in less than a year, and then would be able to make 20 – 50 times the salary they could have earned on Earth. Many people saw the great opportunity this presented, and so they volunteered. Since the journey is long and very expensive, special modular mining machines were developed and given to the settlers, so they could mine the most variety of materials without any additional equipment. Once materials are mined, giant railguns are then used to launch the mined materials into orbit, where they are collected and shipped back to earth. For awhile, everything worked as planned. Slowly, the nations of earth began demanding more from the settlers. They started moving in military forces to help enforce their quotas and prevent anyone from trying to leave. The entire moon started to evolve into a forced labor camp, with the nations never releasing any of the volunteers from their contracts. On February 26th, the first signs of rebel activity were spotted in a resource processing facility. It was only a few days later, on February 28th, that the first meeting of the loyalist’s was discovered. In 2098 the colony erupts in revolution. This is where M.A.V. begins. In M.A.V., you can customize everything! You build your M.A.V. from the ground up, using hundreds of parts and tweaking your build to play how you want it to. Then, express yourself using the custom colors and patterns that can all be applied to each individual part. For when you need to reach out and touch someone. Weapons come from a variety of sources, from old mining equipment to military grade technology, and everything in-between. There are your standard classes like machine guns, rifles, shotguns, and howitzers. There are also some more … creative varieties, like flamethrowers, mining spikes, mines, and rail guns. One thing is for sure, you will always be able to find something to fit your style and build. Your chassis is the primary platform of your MAV and will guide the role you play in the battle just as much as your weapons selection. Each chassis brings it’s own unique strengths to the table, whether that be the tough as nails treads or the agility of the biped legs. What good is a hunk of metal? Your generator will be your primary power supply and keep you powering through battles. You need enough power to operate all your systems, but will you pick a larger generator to overpower your chassis for a speed boost at the cost of additional heat? How will you place your generator to protect it in battle? There are millions of different configurations waiting for you to try! Auxiliary parts come in all different shapes and, while heavy and expensive, can drastically alter the battlefield to give you and advantage. You can grab a CommSys part to gain insights to the enemies positions or grab a sniper turret deployable to help cover your teammates while you rush in. Teamwork is key in making the most use out of the auxiliary parts! Lets face it, sometimes you just want this thing over on that thing. Spacers are here to save the day! Run out of attachment points? Use a spacer to add more! Can’t get parts to fit just right? Use a spacer to bump them into just the right spot! Want to make a walking wall of armor? Spacers will be your friends! It’s a big hunk of metal. Not a lot more to say about it. Shapes are important though, so there are many different sizes and shapes to make sure you can always protect that vital piece of equipment, if you can spare the weight that is. Attackers are the workhorses of any squad deploying into the battlefield. They maintain their maneuverability, without sacrificing survivability or firepower. If they get close, they will make quick work of any other M.A.V. Defenders act as a last line of defense. Giving up speed, they can stack on massive amounts of armor and defensive deployables. As 1 man armies, they can set up choke points and hold back forces many times greater than themselves. The support role is a varied role, but will primarily be indirect support fire. Using the information provided by scouts and engineers, they can quickly remove structures, snipers, or even the entrenched defenders. Scouts are the eyes and ears of the team. 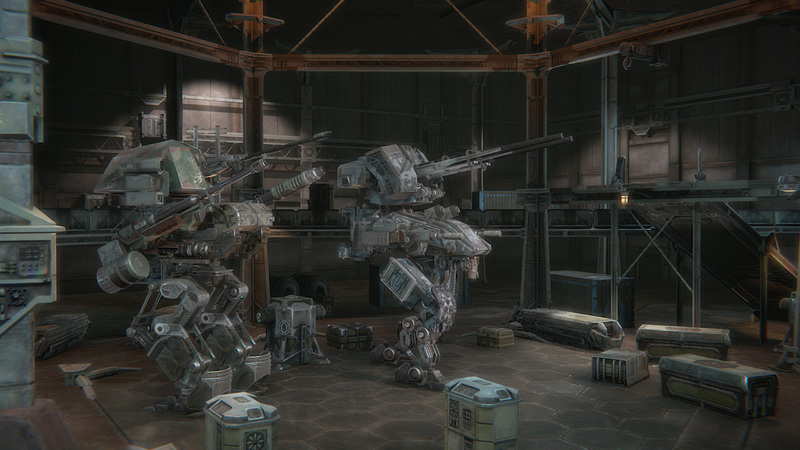 They provide the vital info that Attacker and Support roles need, and make great anti-sniper units. They will typically sacrifice survivability for speed and maneuverability. Snipers are the long arm of death. Delivering surgical strikes at extreme distance is exactly what this role does best. Wait for the right shot, and hit the weak point, and you can cripple an enemy M.A.V. before it can even see what hit it. The engineer role is the leader of the pack. They tap into the intel streams that scouts and all the other team mates provide and relay that on. They have unique view of the battle field, so it is up to them to send out orders and information to the rest of their team.